Was your valentine meant to be? Some of you have been so lucky to meant the person you want to spend the rest of your life with, through good and bad, joy and sorrow. That special person is your 'meant to be' valentine! 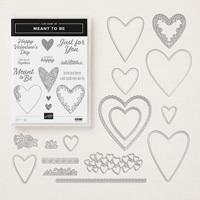 The Meant to Be stamp set is perfect for those happy occasions in life. It has 13 cling stamps and the set is available in English, French and German! 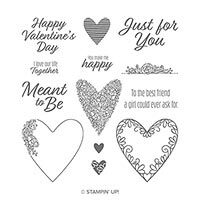 Note: cling stamps are a brand new product by Stampin' Up!. Click here to see my video introducing cling stamps. This is the week to purchase the Meant to Be bundle so you get it in time to create fun Valentine ideas without that time-crunch stress. 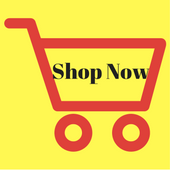 You can click on the bundle photo above to link over to my Online Store. Here's your Meant to Be Valentine card, which also uses the All My Love designer paper. 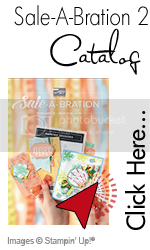 See a full list of instructions under the card photo and then keep scrolling down for a peek at the inside design! Stamp the 5 1/4” x 2 3/4” Whisper White layer with the Meant to Be stamp in Lovely Lipstick. Adhere that section plus the 1” x 5“ piece of coordinating DSP to the inside of the card. Adhere the two hearts together and attach to the front of the card with dimensionals. Make sure you only apply then to the left side of the heart so you don’t glue your card shut.